Summer Stevenson is an eleven-year-old military kid who dreams of having a permanent home and swimming in the Olympics one day, just like her idol Olympian Lia Neal. But those things seem out of reach as her parents “the heroes” continually move the family from house to house like boxed-up toys. After their last move, she thought her life would never change, but now the moving truck is idling in front of her house again, this time taking the family to Valencia, a small town in southern California known for its bike trails, roller coasters, and great schools. But things aren’t so great for Summer. She worries constantly that her fighter-pilot mom could be redeployed at any moment, and she struggles to make new friends, finding herself in humiliating circumstances with her neighbors. Summer sees a glimmer of hope when her parents sign her up for competitive swimming, but she turns out to be the worst swimmer on the team! Inspired by nature and drawing support from friendships both old and new, including those with Grandma “Bachaan,” her coaches, and other kids on the swim team, Summer seeks the courage she’ll need to tackle life’s challenges. Summer Stevenson has spent the whole of the eleven years of her life being moved from one place to another, as she is the daughter of military parents who have had to move around a lot with their careers. She has two dreams in life; one is to have a permanent place to call home, and the second is to become an athlete, as she wants to become an Olympic swimmer. When her parents have to move home again, this time to Valencia in California, Summer is not looking forward to the move, and is apprehensive about having to start all over again in a new place, new school and with no friends. This time though something feels different, and when she is allowed to sign up for swimming lessons, she keeps her fingers crossed that this is the last time the family will move. Nothing would please her more than being able to settle in one place. Flexible Wings is a beautiful tale of one young girls heartbreak at having to move so often, and each time have to leave her friends behind. Because her family move so often, Summer tends to feel lonely. She also comes across at the start as a little depressed. She finds it hard to come to terms with her parents’ careers, as they are often away on tour, and she worries whilst they are away. She is a shy, timid girl who finds it difficult making friends, and has a lack of self-esteem. One of the problems which she feels contributes to her problems is that she is of African-American origin. However, just like the ‘Hummingbird’, you get to watch Summer grow from strength to strength throughout, and eventually you see her spread her wings and learn to love life again and enjoy herself, like every eleven year old should be able to. This is an emotional story of one young girl trying to find her way in this world and overcome her problems by facing them head on. A fantastic book that will tear at your heart-strings, yet put a smile on your face. As a child growing up in New Orleans, Veda Stamps developed her lifelong love for storytelling while exchanging pen-pal letters with her cousin in California. 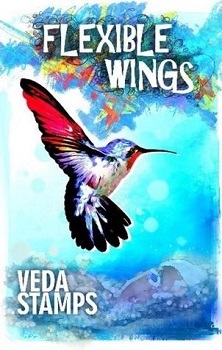 Flexible Wings is her first full-length novel, and is inspired by her community’s spirit of volunteerism and the kindness of the parents on her daughter’s neighborhood swim team. She currently lives with her husband, two daughters, and three dogs in southern California, where she co-owns a community planning firm.